"The bald cypress, 1975" by L. Michael Hill Ph.D. 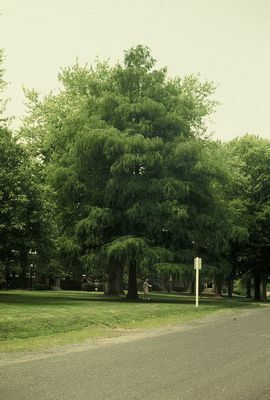 The bald cypress (here in 1975) still stands in the older part of campus on the south side of East College Street. In their usual swamp environment, the roots produce “knees” which project above water where an oxygen supply exists. Those attempts at forming knees can be seen in a perimeter around this bald cypress tree on campus. Mowing has kept them from growing.